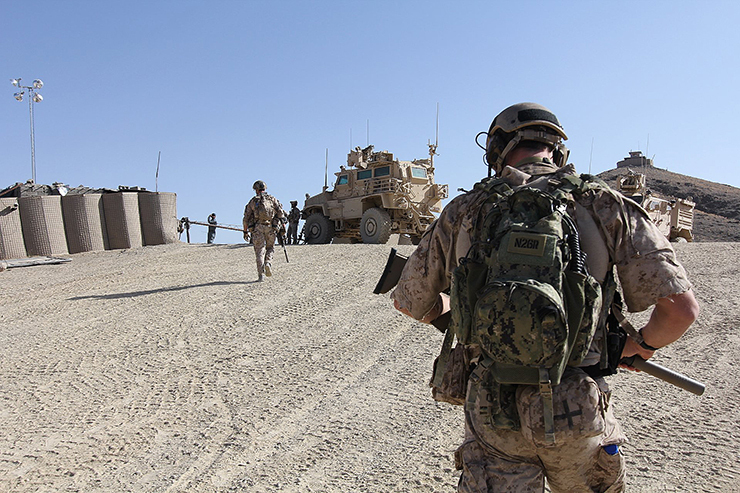 The US is considering to pull about half of its current fighting force out of Afghanistan in order to pave the way for an eventual withdrawal. The RAND corporation has even prepared a peace-plan, which it shared with diplomats in Kabul, according to which, apart from other things, a phased but full US withdrawal would take place. This was always going to happen; for, no country, howsoever powerful, can fight a war for-ever. But the US plan was to stay in Afghanistan for an indefinite period. At least this is what the Bi-lateral Security Agreement had stipulated. The crucial anchor of this stay was not just the US military forces, but the Afghan security forces, which is why the US spent billions of dollars to train and equip them in order for them to take charge of the country. Part of the plan was to retain a small contingent US force in Afghanistan to make sure that the Afghan security forces would have all the ‘help’ they needed to retain control of the country’ security situation. But all of this has failed. Starting from the US’ Cointer-Insuregncy (COIN) strategy to Trump’s “regional approach”, the US has failed to retain its control that it was once able to achieve for some years after the invasion in 2001. A crucial element in this failure hasn’t just been the US forces’ inability to defeat the Taliban; even more crucial has been their failure to establish a force that would play their role and let the US control Afghanistan through seemingly in-direct methods. But this force is no more than a disaster, and quite often leaves behind trails of abuse and popular anger than actual or potential military gains against the Taliban. The Afghan air force, despite consuming about US$ 8 billion, remains a pile of engines and pilots, useful for nothing but killing more civilians than the Taliban fighters. If the Taliban are killing more Afghan soldiers every year than the Afghan government can recruit, the Afghan air force is killing more civilians perhaps than the Taliban can recruit as Talib fighters. According to a September 2018 report of the UNO, the number of civilian deaths has risen sharply in the country, and the role that Afghan air force has played in it is startling. In April 2018 Afghan military helicopters bombed a Kunduz Province mosque, killing at least 70 people and wounding 30 others. That this happened in Kunduz and that Kunduz is a region where the Taliban have staged big city-wide attacks explains how the abuse of power by the Afghan air forces against civilians is most likely turning Afghan civilians of Kunduz into potential Taliban fighters or even sympathisers, allowing the Taliban to capture the city. “It is of particular concern that women and children made up more than half of all aerial-attack civilian casualties,” the UN mission report said. This indiscriminate killing is, however, not the exclusive trait of the air force; the ground forces aren’t falling behind in their ‘duty to kill the civilians.’ This is especially true of those units, called counter-terrorism pursuit teams, which are directly recruited, equipped and trained by the CIA. According to an investigation carried out by the New York Times, many of the missions carried out by these units come at the cost of innocent civilian lives, thus alienating the Afghan population. According to the report, in one of the such numerous cases of civilian deaths, “two brothers were killed as they watered their fields before dawn after receiving permission from the local security outpost.” And, as the report continues, “in another [case], a unit pursuit of a Taliban target went into the wrong house in Laghman Province and killed 12 civilians”, leading local people to call for an investigation into war crimes. This disaster is even more disastrous given that these groups are only nominally answerable to the Afghan government. They operate rather outside of the purview of law, and often brutally kill Afghans who are even suspected of being Taliban sympathisers, let alone being Taliban fighters, armed and attacking these units. Given the endless trail of abuse, is it surprising that the US has failed, both militarily and politically, to defeat the Taliban? Accordingly, if the US president Donald Trump has now decided to withdraw from Afghanistan, could this be the result only of what the US officials have been calling “foreign support” that the Taliban continue to receive. Earlier, the only country that the US would accuse of providing support was Pakistan. Now, Russia, too, has been given this ‘honour’—something that only serves to hide the endless trail of abusive and disastrous strategies and tactics that the US forces as well as the US trained Afghan forces have adopted to defeat at any cost, including the cost of innocent human life, the Taliban.